T.W. MCGUIRE INTERNATIONAL offers a broad range of corkscrews for both promotion and retail sales. Its extensive line of wine waiter corkscrews features the Pulltap's Promotional and Gift lines, imported directly from the factory. The Pullparrot from the same manufacturer is also available, along with the specialty Brucart. offer the famous Chateau Laguiole hand made corkscrew, which comes in its own leather pouch. To round out the offering there is the Model 55, with a rubberized handle, and two economical lines, the Leonardo and the Pro Model 20. In addition the company directly imports the classic Zig-Zag. Considered a 'living antique,' this corkscrew was first created over eighty years ago and is still produced in France, an exact copy of the original. All wine waiter corkscrews can be personalized, with pre-production samples available on demand. Waiter's kits, including a belt-attached pouch, corkscrew, crumber, and pen can be custom produced to your specifications. 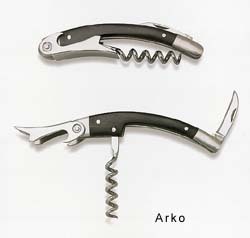 Corkscrews are an invaluable tool in the food service trade and a perfect gift item for any occasion. All models have been chosen for their sturdy construction, tempered steel worms (the part that goes into the cork), ease of use, and long lifespan. New models are constantly being produced and it is impossible to list here every one. If you don't see the particular model you seek, please contact our office for more information.